Due to the efforts of numerous clinicians and basic scientists over many years, we now have a firm understanding of how the motor signal generated in the brain travels down the spinal cord, into a peripheral nerve, and interfaces with the target muscle. Furthermore, we are now able to analyze many aspects of this complex process in the clinic or at the bedside via clinical examination findings, pharmacological challenge, or electrophysiological equipment (see the image below). These advances in scientific understanding that have directly impacted clinical efficacy represent an excellent example of translational research. A typical decrementing response to repetitive nerve stimulation in myasthenia gravis. The amplitude of the initial response is normal, and the decrement is maximal in the fourth response. Thereafter, the responses increase somewhat, giving a U-shaped envelope to the train of responses. In the 1970s, new techniques emerged that allowed for further investigation of the function of the neuromuscular junction. In particular, the use of alpha-bungarotoxin, a compound derived from snake venom, that bound to specific portions of the acetylcholine receptor (AChR) was pioneered by pharmacologists C. C. Chang, C. Y. Lee, and L. F. Tseng. Further contributions from clinician-scientists such as Andrew Engel, Douglas Fambrough, Edward Lambert, Vanda Lennon, Daniel Drachman, Eric Stalberg, Joze Trontelj, Jan Ekstedt, John Newsom-Davis, David Richman, Marjorie Seybold, and Klaus Toyka helped to integrate the emerging immunologic-neurophysiologic connections suggesting that the disorder was secondary to immunologic dysfunction at the postsynaptic motor end plate. A nerve action potential arrives at the axon terminal. Voltage-gated calcium channels open and calcium ions enter the neuron. A biochemical cascade ensues, causing vesicles containing acetylcholine (ACh) to fuse with the cell membrane, releasing ACh into the synaptic cleft. ACh diffuses across the synaptic cleft and binds to nicotinic AChRs on the postsynaptic cell membrane. The AChRs, which are sodium ion channels, open and allow sodium ions to flow into the muscle cell. Several other nearby membrane proteins including agrin, rapsyn, and muscle-specific tyrosine kinase (MuSK) influence both the function and the positioning of the AChRs. The influx of sodium (accompanied by an exit of potassium through potassium channels) causes depolarization of the muscle cell membrane. If depolarization is sufficient, it triggers a regenerative muscle action potential that spreads throughout the cell into the transverse tubules. This causes a release of calcium from the sarcoplasmic reticulum, which initiates muscle contraction. When the ACh molecule is released from the AChR, it is degraded by the enzyme acetylcholinesterase (AChE) into acetate and choline. After reuptake by the neuron, choline is combined with another acetate group to reform acetylcholine, which is subsequently repackaged into a vesicle. Our current understanding of neuromuscular transmission is now complemented by modern methods for diagnosis of dysfunction at the myoneural synapse. The primary components for clinical assessment are history and physical examination, pharmacologic challenge, neurophysiologic (electrical) studies and neuroimmunologic assays. Each of these are discussed in the following sections. A history of diplopia, ptosis, difficulty swallowing, or other bulbar signs is common in MG. These signs are, of course, present in other entities. The physical examination typically flows out of the history, and one should be especially careful to follow up and specifically test for any problems that have been mentioned. Fatigability can be tested, at least to an extent, by asking the patient to perform repetitive motions or to hold fixed postures. Often, the examiner can use him or herself, or another observer, as a control. Following up on what has been mentioned in the history is often best. Eyelid function, especially the ability to keep the eyes open, is one of the easiest things to observe, and if MG is suspected, it is probably worth testing even if the history of ptosis is not definite. Since ptosis is such a common sign in MG, many physicians have focused upon it and developed a number of diagnostic methods to use ptosis as an index of impaired neuromuscular transmission, especially in MG. Knowing some of the relatively easy physical diagnostic methods of detecting ptosis can be useful. None of these are specific for MG or for any type of neuromuscular transmission, but, in the proper setting, they can be quite helpful. The Simpson test is the simplest. Simply ask the patient to look up at a fixed point for an extended period. This frequently brings out the ptosis in a patient with MG, ie, preexisting ptosis may become more exaggerated after this maneuver or one may see ptosis that was not initially present. Another test, the extended fatigue and recovery bedside test, has recently been published by Toyka. If the patient does not initially have ptosis, one can provoke it as in the Simpson sign. Then, instruct the patient to close both lids maximally for 10-30 seconds. Next, ask the patient to open both eyes. Initially upon opening, the ptosis may go away, only to return again in 10-30 seconds. Also, sometimes on opening, one will see the Cogan lid twitch sign. The ice pack test can be viewed as a transition between the clinical methods listed above and the more complicated studies discussed later. For the ice pack test, a disposable glove or specimen bag filled with ice is applied to the ptotic eye(s). A positive test result is when one observes improvement in the ptosis shortly after the application of the ice. This is because neuromuscular transmission improves at cooler temperatures. This test is generally believed to have good sensitivity and specificity, though it is probably more subject to false-positive and false-negative results than the Tensilon test. Edrophonium chloride (Enlon, Reversol, Tensilon) is primarily used as a diagnostic tool to predict the response to longer-acting cholinesterase inhibitors. As with other cholinesterase inhibitors, edrophonium chloride decreases the metabolism of acetylcholine, increasing the cholinergic effect at the myoneural junction. Weakness from abnormal neuromuscular transmission improves after intravenous administration of Tensilon. For a Tensilon test result to be considered positive, a dramatic, unequivocal improvement in muscle function should be observed directly by the examiner. This test is most reliable when the patient has ptosis, ocular muscle weakness, or nasal speech, and results are positive in about 90% of such patients. Strength after Tensilon also may improve in motor neuron disease and in lesions of the oculomotor nerves. After an initial injection of 2 mg, the response in the selected muscles is monitored for 60 seconds. Subsequent injections of 2 mg are given at 60 second intervals for a total dose of 10 mg. If definite improvement is seen within 60 seconds after any dose, no further injections are necessary. Total dose in children is 0.15 mg/kg. The optimal dose of Tensilon varies among patients and cannot be determined in advance. Bradycardia is a possible adverse effect, particularly in elderly patients, and ECG monitoring is advisable in this patient population. Atropine sulfate should be available at the bedside when performing the Tensilon test. Supportive respiratory measures should also be readily available when administering Tensilon because some patients are rather sensitive to even a small dose. Worsening weakness after administration of these doses of Tensilon (a paradoxical response) is also indicative of impaired neuromuscular transmission. In the past, many have advocated also giving a placebo in a single-blinded fashion (ie, the patient does not know which injection is the Tensilon and which is the placebo). In cases in which either malingering or a conversion disorder is suspected, a placebo would be helpful in making this determination. In this situation, the Tensilon test may expose the patient to unnecessary risk. Usually, this has little use, and it should not be necessary with a well-defined endpoint, such as relief of ptosis. Patients who do not respond to Tensilon may respond to intramuscular neostigmine (Prostigmin), which has a longer duration of action. This is particularly useful in infants and children, whose response to Tensilon may be too brief for adequate observation. Neostigmine inhibits the destruction of acetylcholine by acetylcholinesterase, which facilitates transmission of impulses across the myoneural junction. In some, a therapeutic trial of oral pyridostigmine (Mestinon, Timespan, Regonol) for several days may produce improvement that cannot be appreciated after a single dose of Tensilon or neostigmine. Pyridostigmine acts in smooth muscle, the CNS, and secretory glands, where it blocks action of acetylcholine at parasympathetic sites and facilitates transmission of impulses across the myoneural junction. Many patients with muscle-specific tyrosine kinase antibody (MuSK-Ab)-positive MG, a variant, do not improve with Tensilon or pyridostigmine. The anti-AChR antibody test is the mainstay of immunologic testing. The test exhibits a high sensitivity and an extremely high specificity. The sensitivity varies with the clinical presentation of the MG. For patients with generalized MG, the sensitivity is roughly 85-90%. For ocular MG, sensitivity is 50-60%. The specificity is very high, although, interestingly, false-positive results are not uncommon in Lambert-Eaton myasthenic syndrome (LEMS). False-positive results are also seen in thymoma without MG and lung cancer. A third group of authors used quantitative measures of oculobulbar, facial, and respiratory muscle involvement and concluded that they did not see a significant difference in distribution of muscle weakness between their patients with MG with anti-AChR antibodies and those with anti-MuSK antibodies. Each of these series had 20-30 patients; thus, larger studies need to be performed. Also, the limited studies so far suggest that less thymic pathology may exist in anti-MuSK MG, and the role of thymectomy remains uncertain at present. Anti-SM antibodies are a reasonably sensitive and specific marker for the existence of thymoma, especially in the younger patient (< 40 y). In older patients, they are less specific for thymoma. Thus, in a patient already believed to have MG, a positive anti-SM test result should prompt a very thorough check for thymoma (via chest MRI and/or CT scan with and without contrast). If the scan results are negative, a follow-up scan within a year of diagnosis may also be a good idea. However, the anti-SM antibody test is not primarily a test for MG itself. Electrodiagnostic studies are used to demonstrate abnormal neuromuscular transmission and to exclude other diseases of the motor unit that mimic or contribute to the clinical findings. Such studies may also be useful in measuring the severity of involvement and demonstrating changes as the disease evolves or improves. The most commonly used electrodiagnostic test of neuromuscular transmission involves repetitive stimulation of a motor nerve (RNS) while recording compound muscle action potentials (CMAP) from a muscle innervated by that nerve. This is essentially the Jolly test originated by Dr Friedrich Jolly, as mentioned in the Introduction. In his recordings, he quantified the force produced by the muscle rather than the CMAP (however, the force generally correlates with the CMAP). The result is abnormal if progressively fewer muscle fibers respond to nerve stimulation during a train of stimuli, producing a "decrementing" pattern in the CMAP. Although the technique is straightforward, it is not without technical pitfalls for the unwary. Most common errors result from movement of the recording electrode, variations in the stimulus intensity, and inadequate warming of the muscle. Surface recording electrodes are placed so that an initial sharp negative (upward-going) deflection of the CMAP is produced by supramaximal nerve stimulation, indicating that the active electrode is over the motor point of the muscle. The reference-recording electrode should be over a distal point where electrical activity from the muscle is minimal. Intramuscular needle electrodes should not be used to record the responses, since they cannot be kept at a constant position within the muscle during nerve stimulation. Appropriate joints should be immobilized to minimize movement artifact. Decremental response in MG is lessened when the muscle is cool. When the abnormality is mild, no decrement may be seen unless the muscle is warmed. Hand or foot muscles should be warmed to a surface temperature of at least 34°C to obtain maximum diagnostic sensitivity. Cooling is not as great a factor in proximal muscles, which need not be warmed before testing. Stimulation of the motor nerve usually is performed with surface electrodes. Stimulation also can be performed with near-nerve needle electrodes, in which case, shorter-duration and lower-intensity stimulation pulses may be used, which are less painful when the needles are placed optimally. To ensure maximal responses throughout the testing session, the stimulus intensity should be 10-25% greater than required to activate all muscle fibers. A decremental response in MG is best demonstrated at stimulation rates of 3-5 Hz. Some laboratories also use 2 Hz. Decrement increases with the stimulation rate, up to 10 Hz. At rates greater than this, the CMAP size may increase during stimulation (ie, potentiation), and artifacts due to movement are common. Amplitude increments up to 50% have been reported in normal muscle with stimulation at rates of 10-50 Hz. Potentiation may result from an increase in the number of activated muscle fibers (ie, facilitation) or from an increase in the amplitude or summation of action potentials of the individual muscle fibers (ie, pseudofacilitation). A diagram of pseudofacilitation in the muscle responses seen during high-frequency repetitive nerve stimulation. Amplitude of the responses increases due to shortening of the waveforms, but the area under the waveforms remains relatively constant. Facilitation results when 2 or more nerve action potentials occur within a short time, producing a transient increase in the amount of ACh released from the motor nerve. Each nerve depolarization releases calcium into the periterminal space, which increases the local concentration of calcium for a short period of time. If the nerve depolarizes during this period, the increased calcium increases the number of ACh quanta released. In conditions of impaired neuromuscular transmission, this greater ACh release may improve synaptic transmission briefly, producing facilitation. 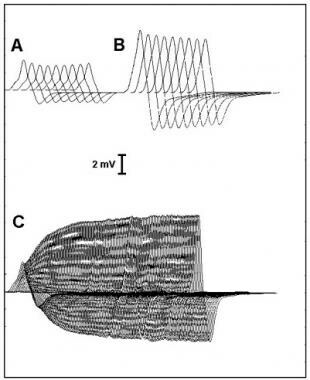 Pseudofacilitation has been attributed to increased synchronization of muscle fiber action potential propagation velocities or to hyperpolarization of the muscle fiber membrane from increased sodium-potassium pumping. In normal muscle, pseudofacilitation may increase the CMAP amplitude 50% during stimulation at rates up to 50 Hz. This can mask a decrementing response or may be mistaken for true facilitation. The size of the CMAP may be assessed by measuring either the amplitude or the area of the negative peak of the CMAP. The CMAP should be observed at a fast display sweep speed (50-100 msec sweep duration) during repetitive stimulation to detect technical artifacts. Movement of the stimulating electrode or the muscle may produce irregular patterns of change in CMAP size during trains of stimuli (these do not correspond to patterns expected in disease). In MG, the typical pattern is a progressive decrement of the second through the fourth or fifth response, with some return toward the initial size during the subsequent responses, a so-called U-shaped pattern (see image below). This pattern also is seen in Lambert-Eaton myasthenic syndrome (LEMS), motor neuron disease, and rarely in peripheral nerve disease. Changes in CMAP size are quantified by calculating the percentage change in amplitude (or area) between the first and a later response, usually the fourth or fifth response in a train. Reproducibility: Decrement should be the same when stimulation is repeated after a period of rest. Envelope shape: Changes during a train of stimuli should conform to a pattern seen in disease, without sudden or irregular variations between consecutive responses. Activation cycle: Changes induced by activation (see Activation below) should conform to an acceptable pattern. Typical activation cycles seen during repetitive nerve stimulation. 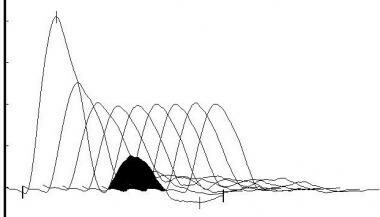 The vertical lines represent the amplitude of muscle responses during 3-Hz repetitive nerve stimulation before and at indicated intervals after activation of the muscle by brief maximum voluntary contraction (arrow). In myasthenia gravis (MG), a decrementing response is observed initially, which partially repairs after activation and is later exaggerated. In Lambert-Eaton myasthenic syndrome (LEMS), the responses are small. A decrementing response occurs, and activation is followed by a marked and brief increase in response amplitude. Response to Tensilon: Administration of intravenous Tensilon usually reduces or obliterates a decrement that is due to abnormal neuromuscular transmission. In some cases, a paradoxical response to edrophonium may be observed in which a decrement worsens or appears only after administration of Tensilon. Either response indicates that neuromuscular transmission is abnormal. Activation: A period of nerve activation is followed by 2 consecutive phases. During the first, facilitation, each nerve impulse releases more ACh than before activation. During the second, postactivation exhaustion, less ACh is released by each nerve impulse. The exhaustion is maximum 2-5 minutes after the end of activation. The nerve may be activated by high-frequency nerve stimulation (20-50 Hz) or by having the patient contract the muscle maximally for 10-30 seconds; the latter is less painful. 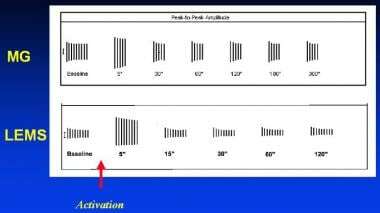 Depending on what disease one is expecting, the length of the activation period may be varied. Generally, 10 seconds is enough to demonstrate facilitation in LEMS. For MG, 10 seconds may also be enough to get the facilitation but not enough to show a definitive period of exhaustion, which is also very helpful in the diagnosis. Thus, at least 30 seconds of voluntary activation is frequently used. Even up to 2 minutes may be required to produce exhaustion in MG. Trains of low-frequency stimuli are given within 10 seconds after the end of activation to demonstrate facilitation and at intervals for up to 10 minutes thereafter to demonstrate postactivation exhaustion. RNS is more likely to be abnormal in proximal or facial muscles, owing to the fact that they are more involved in the disease process. To obtain the maximum diagnostic yield, examination of several muscles, including those that are involved clinically, may be necessary. Hand muscles are the most convenient to test. Recordings can be made from the hypothenar or first dorsal interosseous muscles while stimulating the ulnar nerve at the wrist or from the thenar muscles while stimulating the median nerve. Stimulating the musculocutaneous nerve in the axilla tests the biceps. This nerve can be stimulated with surface electrodes pressed firmly against the posterior border of the short head of the biceps within 1 inch of the inferior edge of the axillary fold. Such stimulation may be uncomfortable, especially if prolonged or high-frequency trains are used. A needle-stimulating electrode inserted near the nerve reduces discomfort and is less likely to be dislodged during stimulation and activation. To test the deltoid muscle, the active recording electrode is placed on the belly of the muscle and the reference on the acromion. Stimulation is performed at the Erb point with a surface electrode pressed firmly behind the clavicle. This stimulation is uncomfortable, and stimulating other muscles cannot be avoided. The trapezius is perhaps the easiest shoulder muscle to test (see image below). The patient is examined while seated on a chair with the arm hanging straight down. The active recording electrode is placed on the trapezius at the angle between the neck and the shoulder, and the reference electrode is placed on the acromion. The spinal accessory nerve is stimulated at the posterior border of the sternocleidomastoid muscle behind the ear. The nerve is superficial at this point and can be maximally stimulated with low-intensity pulses, which minimize discomfort and avoid stimulating other muscles. Electrode positions for performing repetitive nerve stimulation of the trapezius muscle. The active recording electrode (black) is placed over the belly of the muscle and the reference-recording electrode (red) distally over the shoulder. The spinal accessory nerve is stimulated as it crosses the sternocleidomastoid muscle. The green wire is the ground. Facial muscles are tested with the active electrode over the nasalis and the reference electrode lateral to the eye. Alternatively, the inferior orbicularis can be studied, with the reference over the nose. The facial nerve is stimulated below the ear. However, movement artifact frequently limits the interpretation of responses from facial muscles, and many patients may not tolerate the stimulation. Study of the motor unit action potentials (MUAPs) with the standard concentric or monopolar EMG needles often provides considerable information about transmission at the neuromuscular junction. The MUAP demonstrates variability in the shape or amplitude. 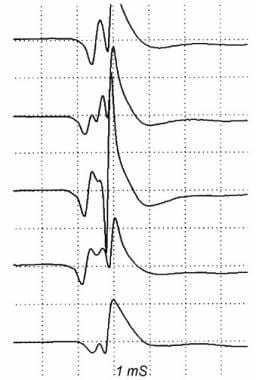 Action potentials from a single motor unit in a patient with Lambert-Eaton myasthenic syndrome. The waveforms vary from discharge to discharge, indicating abnormal neuromuscular transmission. Single-fiber EMG (SFEMG) is the most sensitive electrodiagnostic test of neuromuscular transmission. SFEMG demonstrates increased jitter in a limb or face muscle in almost all patients with MG. Because of its marked sensitivity, SFEMG also demonstrates abnormal jitter in other nerve and muscle diseases; thus, the results must be interpreted in conjunction with the results of more conventional electrodiagnostic studies. The details of this technique are well described in Single-Fiber EMG. However, some basic principles of the single-fiber method are described below. The single-fiber technique was developed by Stalberg and Ekstedt in order to study muscle fatigue. It is the most sensitive test of dysfunction at the neuromuscular junction. Ordinarily, it requires a special needle electrode. The needle is thin, 25 μm in diameter, but no thinner than most monopolar needles or the smaller concentric needles. Its configuration is quite unusual. Although it has a pointed bevel at the very tip, the opening for the recording surface is located on the side, a bit proximal (3-5 mm) to the tip. The recording surface is very small, and the volume of tissue from which it effectively records is tiny, only about 300 μm3 compared to 1 cm3 for most standard concentric needles. Because of the small size of the area sampled, a single-fiber needle is able to pick up and discriminate potentials from single nearby muscle fibers, as opposed to the composite motor unit potential (MUP) (also called motor unit action potential [MUAP]), which is picked up by the standard monopolar or concentric EMG needle. The examiner asks the patient to contract a muscle slightly with the single-fiber needle in place. Under those circumstances, the needle usually records a single MUP at a time. However, occasionally, it picks up two MUPs that fire at slightly different times. Because the recording volume of the needle is so small, it is a good bet that the two MUPs are coming from two individual muscle fibers that are very close together and which are part of the same motor unit. As the muscle continues to contract, one might expect that if muscle fiber Ma contracted T microseconds before muscle fiber Mb, then each time Ma contracts Mb will contract exactly T microseconds later. Of course, biological processes always have some variation, but if one tries to keep all conditions the same, the differences should be small. Indeed, for normal neuromuscular junctions they are small, usually in the range of 10-50 microseconds (ms). However, when a problem occurs with the function of the neuromuscular junction, then the variation is greater. This variation is called the jitter. The test result is positive when the jitter significantly exceeds the norm. It is highly sensitive for MG (at least 90% and probably 95%) but not very specific. Some patients are unable to voluntarily contract the muscle in order to allow SFEMG to be performed. In those cases, often the examiner can produce the contraction by electrically stimulating a branch of the nerve innervating the muscle. See Single-Fiber EMG for more detail. RNS demonstrates an abnormal decrement in a hand or shoulder muscle in 75% of patients with generalized MG and in only 50% of patients with ocular MG. Testing a facial muscle increases the yield somewhat, especially in patients with weakness that predominates in these muscles. SFEMG demonstrates abnormal jitter in at least 1 muscle in 99% of patients with generalized MG and in 97% of those with ocular MG. Increased jitter and blocking frequently are found in muscles in which no decrement is seen on RNS, but the converse is not observed. SFEMG is most valuable clinically in the patient with suspected MG in whom other tests of neuromuscular transmission and AChR antibody measurements are normal. When abnormal neuromuscular transmission has been demonstrated by RNS, the finding of abnormal jitter does not add to the diagnosis, although baseline jitter values may be useful for comparison with subsequent studies. In patients with MUSK-positive MG, RNS and SFEMG studies are frequently normal in commonly tested muscles, and examining the most severely involved muscles to demonstrate a decremental response or abnormal jitter may be necessary. LEMS, is described in detail in Lambert-Eaton Myasthenic Syndrome. However, key points highlighting neuromuscular transmission are discussed here. LEMS is caused by autoantibodies to the voltage-gated calcium channels (VGCC) on the presynaptic side of the neuromuscular junction. Frequently, it is a paraneoplastic disease, with the most common being small-cell carcinoma of the lung (SCLC). Tests for these antibodies are commonly available. In those afflicted with LEMS, repetitive nerve stimulation discloses small CMAP amplitudes (often less than 10% of normal) and a decremental pattern is observed with low-frequency stimulation. See the image below. Repetitive nerve stimulation studies in Lambert-Eaton myasthenic syndrome. The initial response amplitude is low, and a decrementing response to low-frequency stimulation is noted (A). Immediately after activation, the amplitude is increased (B). During high-frequency stimulation (C), the initial decrement is followed by an increase in amplitude to more than twice the initial value. The most characteristic electrodiagnostic feature is facilitation, which is an increase in the size of the CMAP after activation by maximum voluntary contraction or during stimulation at rates of at least 20 Hz. The degree of facilitation varies considerably among patients with LEMS. Findings may be masked partially by low muscle temperature; thus, tested muscles should be warmed for best results. Facilitation greater than 100% (doubling of the CMAP from resting values) is most commonly observed in hand muscles. Not all muscles show this pattern; in some patients with LEMS, facilitation may be less than 100% in all muscles tested. Measure the size (amplitude or area) of the CMAP elicited from the rested muscle by supramaximal nerve stimulation. Warming of the muscle to at least 34°C surface temperature and resting for several minutes before testing is essential. Have the patient contract the tested muscle maximally for 10 seconds and then relax completely. Deliver a supramaximal nerve stimulus as soon as relaxation is complete. This stimulus should be delivered as soon as possible after the end of muscle activation, preferably within 5 seconds. Compare the size (amplitude or area) of the CMAP with that obtained in the rested state (see image below). The most consistent results will be obtained if this sequence is repeated and the average of at least 3 responses is used to assess the degree of facilitation. After several minutes of relaxation, deliver a train of low-frequency (2-5 Hz) stimuli to the nerve and measure the percentage decrement. Muscle responses to nerve stimulation in a patient with Lambert-Eaton myasthenic syndrome. The initial response (left) is very small. After brief maximum voluntary contraction, the amplitude (right) increases markedly. Perform these measurements in at least 1 hand and 1 foot muscle. If facilitation less than 100% is seen in a hand muscle, another hand muscle should be tested. Nerve stimulation at 20 Hz may be used instead of voluntary contraction to activate the muscle, although the authors find the voluntary contraction technique to be more sensitive and less painful. The size of the maximum CMAP after stimulation for 5-7 seconds is compared with that of the initial response (see image below). Measuring the area of these CMAPs is difficult, so the amplitudes usually are measured instead. The seemingly opposite nature of some of the MG findings versus the LEMS findings are not invariably found. Either one of these diseases can somehow imitate the other in what is sometimes called an overlap syndrome. Thus, no single clinical or electromyographic feature distinguishes MG from LEMS in all patients. Some patients with clinically typical MG have facilitation greater than 50% or even up to 100% in some muscles at high stimulation rates. Conversely, patients with LEMS may have EMG features more characteristic of MG at some point during their illness. In other patients, because of mixed clinical and EMG features, distinguishing between these 2 diseases may not be possible. Patients with clinical features typical for MG (including elevated AChR antibodies) have been observed to have an RNS pattern characteristic of LEMS at one time and a pattern typical for MG in the same muscle at another time. In patients with such mixed features, the clinical characteristics and the presence of AChR antibodies or lung cancer define the most likely diagnosis. Several forms of myasthenia are due to genetic defects and are not associated with any immunologic abnormality. Some of these conditions present at birth, whereas other, milder forms of the disease often do not come to clinical attention until adulthood. These diseases do display characteristic electrodiagnostic findings. Congenital myasthenia is a clinical term used to describe patients with one of several genetic neuromuscular defects who usually have ophthalmoparesis and ptosis at birth or shortly thereafter. Electrodiagnostic findings are similar to those of acquired MG. RNS studies demonstrate a decremental response, which is corrected by edrophonium, and SFEMG shows increased jitter. Intracellular recordings of muscle biopsy samples must be obtained to determine the physiologic abnormality and the specific diagnosis in these patients. In some of these diseases, the specific gene is now known, and the potential for diagnosis via genetic testing exists. Congenital myasthenic syndrome associated with episodic apnea is also called familial infantile myasthenia (OMIM #254210). This form of congenital myasthenia has unique clinical and electrophysiological features. Physiological studies in familial infantile myasthenia have demonstrated findings consistent with abnormalities of acetylcholine synthesis, resynthesis, or mobilization. The Mayo Clinic group has identified many specific mutations in the choline acetyl transferase (ChAT) gene on arm 10q that give rise to this autosomal recessive condition. However, another mutation on chromosome 17 (near or actually in the gene for synaptobrevin-2) appears to produce the same phenotype. Clinically, these patients manifest episodes of bulbar weakness and respiratory distress, resulting in apnea. Often times, pyrexia or infection causes the apneic symptoms to manifest. Muscle responses to 3-Hz nerve stimulation in a hand muscle of a patient with familial infantile myasthenia. 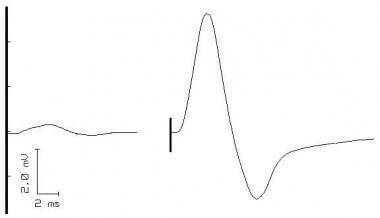 The initial response (A) is normal, but a decrementing response occurs after prolonged 3-Hz stimulation (B). Progressive neuromuscular blockade also can be demonstrated in these patients with SFEMG, which shows increasing jitter during prolonged nerve stimulation. Treatment consists of pyridostigmine or 3,4-diamniopyridine (3-4,DAP). In this disease, whose detailed pathophysiology and genetic mechanism have yet to be fully described, there are decreased total amounts of acetylcholine synaptic vesicles with resultant decreased release of acetylcholine quanta. The probability of quantal release remains unaffected. Ophthalmoplegia, ptosis, and hypotonia are common presenting signs. In endplate acetylcholinesterase deficiency (OMIM #603034), there is weakness of facial, oropharyngeal, neck, and limb muscles seen in the neonatal period (or shortly thereafter). Patients show generalized weakness, which is exacerbated by exertion. Frequently, the pupillary light reflex is slowed (or even absent), and ophthalmoparesis may be present. Scoliosis or lordosis may also be present. The severity of the different symptoms varies considerably from patient to patient. The disease is caused by an autosomal recessive gene (COLQ; 603033) that codes for the collagen-like tail of endplate acetylcholinesterase. Histochemical stains show that acetylcholinesterase is absent from the nerve terminals, which are reduced in size and exhibit a reduced postsynaptic membrane density and degeneration of the postsynaptic folds. An end-plate myopathy is encountered as well, with a proclivity toward type II fiber atrophy. Antiacetylcholinesterase medications such as physostigmine have no beneficial effect, as one would expect; sometimes, they have a detrimental effect (possibly because a small amount of residual acetylcholinesterase activity exists, which is blocked). Albuterol has been used with some success in this disease. RNS produces a decrement on 2-Hz stimulation in all muscles. Single-nerve stimulation produces repetitive CMAPs 6-10 milliseconds after the initial response, which fade quickly during repetitive stimulation, even at rates as low as 0.2 Hz. This is similar to findings in slow channel syndrome. Responses to 3-Hz nerve stimulation in a hand muscle in a patient with slow channel syndrome. A decrementing pattern is noted, and a repetitive discharge (black) is seen following the response to the initial stimulus. In routine electrodiagnostic studies, CMAP after-discharges are often encountered. Two varieties exist: slow-channel and fast-channel syndromes. Clinically, there is ptosis as well as finger extensor and cervical axial weakness. RNS studies produce a decremental response. Characteristic repetitive discharges are seen after single-nerve stimulation in most, but not all, muscles. Electrodiagnostic findings are similar to those seen with cholinesterase inhibitor toxicity and congenital acetylcholinesterase deficiency. The clinical manifestations of fast channel syndrome (OMIM #608930) are somewhat variable. Usually, patients have weakness of ocular muscles with mild-to-moderate weakness of musculature of the face, neck, trunk, limbs, and respiratory muscles. Like most other types of myasthenia, there is easy fatigability. During infancy, children frequently manifest with poor effort in crying and hypotonia. On electron microscopy, the morphology appears intact: the synapses look normal with normal-appearing junctional folds and a normal distribution of acetylcholine receptors. Some response to anti-acetylcholinesterase medications, such as pyridostigmine, occurs, but a better response occurs to 3,4-diaminopyridine (3,4-DAP). The basic neurophysiology is intriguing. The kinetics of the openings and closings of the channel are roughly the opposite of what is seen in slow channel syndrome (ie, in fast channel syndrome, it opens too slowly and closes too fast). Fewer, shorter openings are available. Thus, there is overall a decreased number of openings and an even greater decrease in the channel's open time, leading to small miniature endplate potentials (MEPPs) and small miniature endplate currents (MEPCs). However, quantal content (amount of acetylcholine in each vesicle) is normal. In clinical neurophysiologic studies, decremental responses are seen on repetitive stimulation (but not very many patients have been studied). The authors could not find published studies of single-fiber EMG in fast channel syndrome. From the physiology, it would be expected to be abnormal. The symptoms of this disease, namely ptosis, ophthalmoplegia, dysphagia, muscular atrophy, lordosis, and scoliosis, can manifest over a wide range of ages from childhood to adulthood. Inheritance is autosomal recessive in females afflicted with this disease. The CHRNE gene, which encodes for the epsilon subunit of the acetylcholine receptor, is most commonly found. [56, 58] Genetic testing is available. There are a few post-synaptic congenital myasthenic syndromes that are due to defects in rapsyn, Dok-7, and MuSK proteins, all of which are involved acetylcholine receptor interactions with the postsynaptic cytoskeleton and result in an over-arching reduced function of the receptor itself. The 3 known protein defects manifest with different clinical presentations. Rapsyn deficiency manifests in the neonatal period, often with skeletal deformities such as arthrogryposis, ptosis, bulbar weakness, and proximal-greater-than-distal muscle weakness. In those with Dok-7 mutations, there is marked weakness of the proximal musculature, and it is also known as limb-girdle myasthenic syndrome. These patients present in the neonatal period with hypotonia, and there are often decreased fetal movements in utero. Electron microscopy in Dok-7 discloses endplate destruction with ongoing attempts at repair. Electrodiagnostic studies reveal decremental responses to repetitive stimulation. This is an area of ongoing research, with new mutations being discovered, and, as a result, reclassification of the individual diseases is an ongoing effort. Botulism is discussed in several other articles: emergency and terrorist aspects in CBRNE - Botulism, a pediatric perspective in Botulism, an infectious disease perspective in Botulism, and an ophthalmologic perspective in Botulism. Other articles on botulinum toxin and its uses include Botulinum Toxin (BOTOX®): Dystonia Treatment, BOTOX® Injections, Botulinum Toxin, and Botulinum Toxin: Overview. First, the basic science facts about how botulinum toxin works are reviewed. Botulinum toxin is a presynaptic blocker. In order for the neuronal cell to release ACh into the synaptic cleft, the synaptic vesicles that contain the ACh must fuse with the membrane. This fusion requires a synaptic fusion complex that is composed of SNARE proteins. SNARE proteins are involved in the release of numerous neurotransmitters in many species from mammals through yeast, and they are part of a large superfamily of proteins. For ACh release at the neuromuscular junction, some of the key SNARE proteins are synaptobrevin, SNAP-25, and syntaxin I. Food: Ask about recent food ingestion, especially canned goods or anything that could spoil. Wounds: Visually check for wounds on physical examination. Intestinal colonization in infants younger than 1 year: Laboratory studies of stool samples are indicated. Seek pediatric and pediatric GI consultation. Rarely, intestinal colonization of older individuals with bowel problems such as colitis or in those who have had surgical procedures such as intestinal bypasses: Check for such problems through the patient’s history. Seek consultation as necessary. Toxin injection, as either a consequence of excessive medical injections or deliberate poisoning: Ordinarily, it is very unlikely that anyone would develop significant life-threatening weakness from either Botox® or Dysport® given by competent licensed practitioners. However, rare cases have occurred in which unethical practitioners have used unapproved formulations of botulinum toxin that caused generalized neuromuscular weakness. Inhalational botulism: This has occasionally occurred in laboratory workers. It could occur in deliberate individual poisoning (murder attempt) or during a terrorist attack. One should take enough of an occupational history to rule out occupational exposure. Physicians should use their own judgment regarding suspicions of poisoning and/or terrorism. Some index of suspicion is needed in any case of otherwise unexplained weakness. With regard to physical (neurologic) findings, these are generally symmetric, and the "dozen D’s", as noted in the Taillac and Kim article (see CBRNE – Botulism), that summarize the neurologic involvement should be considered: "dry mouth, diplopia, dilated pupils, droopy eyes, droopy face, diminished gag reflex, dysphagia, dysarthria, dysphonia, difficulty lifting head, descending paralysis, and diaphragmatic paralysis." The dilated pupils in particular and a poor pupillary contraction to light in general are not part of MG, though they are common findings in botulism poisoning. Dry mouth also is a feature of botulism that is not seen in MG (but it is seen in Lambert-Eaton myasthenic syndrome). With respect to blood tests, the criterion standard is presently a mouse toxicity assay. It is often necessary for the mouse to be observed for days. Thus, the neurophysiologic tests described below, which can be performed rapidly, are particularly valuable for investigation of poisoning. An enzyme-linked immunosorbent assay (ELISA) test has become available for rapid screening, though it is not as sensitive or specific as the mouse bioassay. More recently, a procedure using a combination of endopeptidase cleavage followed by mass spectroscopy (Endopep-MS) has been developed;  this test may ultimately become the new criterion standard. However, neurophysiologic testing will remain very important because it can be performed immediately in the office or at the bedside. Not all patients with botulism will have the first finding. If none are found, the diagnosis of botulism is unlikely. If all 4 are present, only hypermagnesemia is in the differential diagnosis (and that can be quickly proven or dispelled by blood Mg levels). Generally, caveats exist with most checklists of diagnostic findings, and this is true of botulism. As has been pointed out by Maselli  and others, the findings in botulism can vary from case to case. CMAP amplitudes usually are reduced, but the reduction is not so striking as is seen in LEMS for example. The reduction could easily be in the range seen in patients with axonal neuropathies. Facilitation with tetanic stimulation is not always seen. If it is not seen, then one can not look for persistence of facilitation or exhaustion after the facilitation. Other features that may be observed include a decrement to slow rate stimulation, fibrillations and/or positive sharp waves, and motor unit action potentials, which are short, small, and polyphasic. The motor units may also recruit early (ie, at relatively low firing rates and degrees of force) as is often seen in a myopathy. Many reasons for variation in diagnostic findings can exist. For example, Cornblath's group found a very high percentage of incrementing responses to high-frequency repetitive stimulation. However, their cases were in infants who mostly had botulinum B toxicity. Studies of adults, who more commonly have botulinum A toxicity, have shown lower percentages of incrementation to high-frequency stimulation. SFEMG demonstrates markedly increased jitter and blocking and has been abnormal in all reported cases of food-borne or wound botulism. Jitter and blocking may decrease as the firing rate increases, but this is not a consistent finding. The most common cause of poisoning by anti-acetylcholinesterases is accidental poisoning via inadvertent pesticide ingestion. In addition to such pesticides as malathion and parathion, chemists have created nerve agents such as sarin and soman, which are much more potent and are designed to be used for military purposes. They also have fallen into the hands of terrorists. Bradycardia, hypotension, and miosis from muscarinic effects and tachycardia, hypertension, and mydriasis from nicotinic effect can occur. Excess acetylcholine at the nerve muscle junction can cause fasciculations and cramps, but then when the depolarization block becomes predominant, weakness and flaccidity are evident. Any muscle or muscle group can be affected. Typically, neck muscles, cranial nerve muscles, respiratory muscles, and proximal limb muscles are the hardest hit. One of the significant points to remember is that, in the same patient, some muscles may be virtually unaffected, others mildly, and others severely affected. This is also true when myasthenic patients are treated with anti-acetylcholinesterases such as pyridostigmine. Sometimes, certain muscles in the same patient may still be weak from the myasthenia at the same time that other muscles are overdosed on the pyridostigmine. Central effects may include mixtures of anxiety and emotional lability, ataxia, delirium, coma, and epileptic seizures. As is the case for botulism, blood tests for anti-acetylcholinesterase poisoning present a problem, considering the need for rapid diagnosis. One approach is to do an enzyme activity assay for cholinesterases. Although this has been automated recently using robotic techniques, one still needs to send the blood to a high-level laboratory and wait for processing. Another approach is to detect the organophosphate compound. This also presents difficulties including the question of which organophosphate compounds are detected. Recently, various rapid methods have been developed including biosensors, which use genetically engineered bacteria whose membranes contain enzymes capable of breaking down certain organophosphates into more easily identified compounds. In most hospital situations, the blood would have to be sent to a highly specialized reference laboratory. Thus, the neurophysiologic techniques, though imperfect, can be especially useful for rapidly deciding whether or not individual or multiple cases of paralysis might involve poisoning with an anti-acetylcholinesterase. Far fewer cases of acetylcholinesterase toxicity have been studied neurophysiologically than is the case for myasthenia gravis. Many of the cases that were studied were examined under emergency conditions of mass intoxications and, thus, could not be studied as fully as is the situation for myasthenia gravis. Therefore, the significance of the findings are less certain. In this, as in most other situations, combining neurophysiologic findings with information from the history and physical examination is best. A single supramaximal electrical stimulation induces repetitive responses. This tends to occur at the earliest stage. It can also occur in slow channel syndrome. A decremental response to repetitive stimulation at low frequency (2 or 3 Hz) with lack of posttetanic or postexercise facilitation. The decrement may be absent. In any case, this would not distinguish from MG, LEMS, or botulism. Lack of a period of posttetanic (or postexercise) facilitation (ie, temporary increase in strength after maximal or near-maximal muscle activation) is against myasthenia and LEMS. A decrement-increment response to high-frequency stimulation (usually 30-50 Hz). One group has found that the decrement-increment response is more common either in the early, before the greatest severity is reached, or in the late stages after the worst has passed. [83, 84] Fasciculations are also commonly seen in these stages. Blocking neuromuscular transmission is a potential mode of terrorism. Neuromuscularly oriented clinicians should think about how they might use the neuromuscular assessment techniques to help combat this threat. Botulinum toxin and anti-acetylcholinesterases (organophosphates) are probably the two toxins that are the most likely to be used because they could be made available in sufficient amounts. In response to a possible terrorist attack with such agents, the principles and methods of neuromuscular transmission assessment described above could prove helpful in the initial as well as later stages of victim assessment. As in medical cases, the initial history and clinical evaluation of the patients takes precedence. For organophosphate poisoning, some independent evidence that it might have been a gas attack would be suggestive. Organophosphates act in minutes, so the context would be people suddenly stricken in a relatively confined area, such as a subway platform. In contrast, botulism has an onset on the order of hours to days. One must also consider that the purified botulinum toxin could be dispersed as an aerosol. Still, some time lag would exist, depending on how much toxin was delivered. For example, in toxin injected for treatment of blepharospasm, the patient usually does not notice much of an effect until the next day. However, extremely high doses could work much more quickly. The previously mentioned mnemonics SLUDGE (salivation, lacrimation, urination, diarrhea, GI upset, emesis) and DUMBELS (diaphoresis and diarrhea; urination; miosis; bradycardia, bronchospasm, bronchorrhea; emesis; excess lacrimation; and salivation) could be helpful. However, one must consider that many of the signs can fluctuate in organophosphate poisoning: bradycardia, hypotension, and miosis from muscarinic effects and tachycardia, hypertension, and mydriasis from nicotinic effects. Excess acetylcholine can cause fasciculations and cramps, but, later when depolarization block sets in, weakness and flaccidity will predominate. Neck muscles, cranial nerve muscles, respiratory muscles, and proximal limb muscles often are the most severely affected. Central effects can include anxiety and emotional lability, ataxia, delirium, coma, and epileptic seizures. In addition, recall the 3 stages of acute paralysis, intermediate syndrome, and later sequelae. First, standard nerve conductions with supramaximal stimulation should be performed. 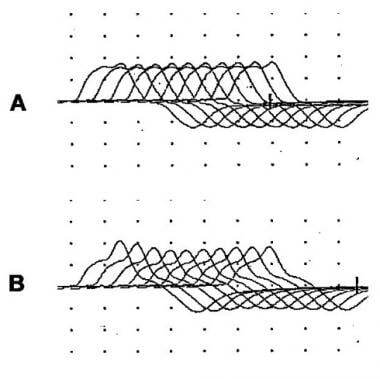 The compound motor action potential (CMAP) amplitudes should be observed. If they are normal, then the poisoning is likely in the anthrax/cyanide group. If the CMAP amplitude is reduced, then the poisoning is either organophosphate or botulism. Additional confirmation might be obtained by single-fiber EMG. Both organophosphate poisoning and botulism should show increased jitter and blocking. However, with increased firing rates, the jitter and blocking in botulism often (but not always) ameliorates, whereas it does not in organophosphate poisoning. Careful attention to divergent autonomic features is helpful. For example, patients with botulism have dilated pupils (which constrict to light poorly) and dry mouth. Organophosphate toxicity causes pupillary constriction (in some phases of the toxicity) and excess salivation. One must always remember that not all potential findings are present in every patient and findings can fluctuate over time. No absolutely foolproof schema that is guaranteed to work in every situation exists. A good knowledge and understanding of neuromuscular assessment techniques should be helpful if the need for rapid triage arises. Both for the more normal clinical purposes and also to aid in differentiating the causes of weakness in large-scale poisonings and possible terrorist situations, the basic points made in this article are summarized in the tables below. Table 1 is a summary of the overall clinical assessment information, and Table 2 summarizes the neurophysiologic assessment methods. Traditionally, young women and older men. More older than younger patients now. Can be gradual or rapid onset. Most appear to be sporadic due to antibodies to AChR or related muscle membrane proteins such as MUSK. Generally similar to noncongenital myasthenia. See Congenital (Genetic) Myasthenic Syndromes for more details. Some forms improve with Tensilon (not the types with mutant AchE). Mouse bioassay is definitive test. ELISA is available but not as definitive. Patients develop antibodies to presynaptic VGCCs, often as a side effect of cancer (paraneoplastic). Weakness is greater in legs and proximal muscles. Usually no bulbar or ocular weakness present. Weakness may ameliorate with repetition. Tensilon test result is usually negative, but negative response not evidence for LEMS. Tensilon test result may be positive. ELISA available but not as definitive. Tensilon test should do nothing or make patient worse. Chemical and biosensor techniques to detect acetylcholinest-erase activity and organo-phosphates exist but are not readily available. DUMBELS: Diaphoresis and diarrhea; urination; miosis; bradycardia, bronchospasm, bronchorrhea; emesis; excess lacrimation; and salivation. Initially, 10-30 sec contraction or high-frequency (tetanic) stimulation repairs decrement for up to 2 min. Then, postexercise exhaustion occurs for 2-5 min. Then, return to original response. MUAPs may be unstable, polyphasic, brief, or low amplitude. Initially, 10 sec contraction or high-frequency (tetanic) stim repairs decrement for 20-30 sec and also greatly increases CMAP size (50-100%). Then, postexercise exhaustion occurs for 2-5 min. Then, return to original response. Often similar to LEMS but much less robust response (smaller increase). The small increase may last longer (a few min) before return to prior size. Also, no postexercise exhaustion occurs. Increased jitter or blocking, which may decrease as the firing rate increases. Decrement-increment pattern in relatively mild weakness. Decrement in severe weakness. Marsteller HB. The first American case of myasthenia gravis. Arch Neurol. 1988 Feb. 45(2):185-7. [Medline]. Walker MB. Case showing the effect of prostigmin on myasthenia gravis. Proc Roy Soc Med. 1935. 28(I):759-61. Willis T. De anima brutorum. Theatro Sheldoniano. Oxford, England: 1672. 404-6. Jolly F. Ueber Myasthenia Gravis pseudoparalytica. Berl Klin Wochenschr. 1895. 32:1-7. Johnston JD. The contribution of Dr. Mary Walker towards myasthenia gravis and periodic paralysis whilst working in poor law hospitals in London. J Hist Neurosci. 2005 Jun. 14(2):121-37. [Medline]. Schumacher ED, Roth J. Thymektomie bei cenem Fall von MorbusBasedowii mit Myasthenie. Mitt a.d. Grezgeb d. Med Chir. 1912. 25:746. Blalock A, Mason MF, Morgan HJ. Myasthenia gravis and tumors of the thymic region. Report of a case in which the tumor was removed. Ann Surg. 1939. 110:544-561. Wolfe GI, et al. Randomized Trial of Thymectomy in Myasthenia Gravis. N Engl J Med. 2016 Aug 11. 375 (6):511-22. [Medline]. Riggs AJ, Riggs JE. "Guessing it right," John A. Simpson, and myasthenia gravis: the role of analogy in science. Neurology. 2004 Feb 10. 62(3):465-7. [Medline]. Drachman DB, Kao I, Pestronk A, Toyka KV. Myasthenia gravis as a receptor disorder. Ann N Y Acad Sci. 1976. 274:226-34. [Medline]. Simpson JA. Myasthenia gravis: a new hypothesis. Scott Med. 1960. 5:419-36. Chang CE, Lee CY. Isolation of neurotoxins from the venom of Bungarus multicinctus and their modes of neuromuscular blocking action. Arch Pharmacodyn Ther. 1962. 144:241-57. Prasarnpun S, Walsh J, Harris JB. Beta-bungarotoxin-induced depletion of synaptic vesicles at the mammalian neuromuscular junction. Neuropharmacology. 2004 Aug. 47(2):304-14. [Medline]. Appel SH, Anwyl R, McAdams MW, Elias S. Accelerated degradation of acetylcholine receptor from cultured rat myotubes with myasthenia gravis sera and globulins. Proc Natl Acad Sci U S A. 1977 May. 74(5):2130-4. [Medline]. Fambrough DM, Drachman DB, Satyamurti S. Neuromuscular junction in myasthenia gravis: decreased acetylcholine receptors. Science. 1973 Oct 19. 182(109):293-5. [Medline]. Lennon VA, Lindstrom JM, Seybold ME. Experimental autoimmune myasthenia gravis: cellular and humoral immune responses. Ann N Y Acad Sci. 1976. 274:283-99. [Medline]. Lindstrom J. An assay for antibodies to human acetylcholine receptor in serum from patients with myasthenia gravis. Clin Immunol Immunopathol. 1977 Jan. 7(1):36-43. [Medline]. Lindstrom JM, Seybold ME, Lennon VA, Whittingham S, Duane DD. Antibody to acetylcholine receptor in myasthenia gravis. Prevalence, clinical correlates, and diagnostic value. Neurology. 1976 Nov. 26(11):1054-9. [Medline]. Patrick J, Lindstrom J. Autoimmune response to acetylcholine receptor. Science. 1973 May 25. 180(88):871-2. [Medline]. Satyamurti S, Drachman DB, Slone F. Blockade of acetylcholine receptors: a model of myasthenia gravis. Science. 1975 Mar 14. 187(4180):955-7. [Medline]. Drachman DB. Myasthenia gravis. N Engl J Med. 1994 Jun 23. 330(25):1797-810. [Medline]. Cogan DG. Myasthenia Gravis: a review of the Disease and Description of lid twitch as a characteristic sign. Arch Ophthalmol. 1965 Aug. 74:217-21. [Medline]. Toyka KV. Ptosis in myasthenia gravis: extended fatigue and recovery bedside test. Neurology. 2006 Oct 24. 67(8):1524. [Medline]. Gay AJ, Salmon ML, Windsor CE. Hering's law, the levators, and their relationship in disease states. Arch Ophthalmol. 1967 Feb. 77(2):157-60. [Medline]. Gorelick PB, Rosenberg M, Pagano RJ. Enhanced ptosis in myasthenia gravis. Arch Neurol. 1981 Aug. 38(8):531. [Medline]. Movaghar M, Slavin ML. Effect of local heat versus ice on blepharoptosis resulting from ocular myasthenia. Ophthalmology. 2000 Dec. 107(12):2209-14. [Medline]. Larner AJ. The place of the ice pack test in the diagnosis of myasthenia gravis. Int J Clin Pract. 2004 Sep. 58(9):887-8. [Medline]. Larner AJ, Thomas DJ. Can myasthenia gravis be diagnosed with the 'ice pack test'? A cautionary note. Postgrad Med J. 2000 Mar. 76(893):162-3. [Medline]. Sethi KD, Rivner MH, Swift TR. Ice pack test for myasthenia gravis. Neurology. 1987 Aug. 37(8):1383-5. [Medline]. Daroff RB. The office Tensilon test for ocular myasthenia gravis. Arch Neurol. 1986 Aug. 43(8):843-4. [Medline]. Walker MB. Treatment of myasthenia gravis with physostigmine. Lancet. 1934. I:1200-1. Oh SJ, Cho HK. Edrophonium responsiveness not necessarily diagnostic of myasthenia gravis. Muscle Nerve. 1990 Mar. 13(3):187-91. [Medline]. Shiraishi H, Motomura M, Yoshimura T, et al. Acetylcholine receptors loss and postsynaptic damage in MuSK antibody-positive myasthenia gravis. Ann Neurol. 2005 Feb. 57(2):289-93. [Medline]. Deymeer F, Gungor-Tuncer O, Yilmaz V, Parman Y, Serdaroglu P, Ozdemir C. Clinical comparison of anti-MuSK- vs anti-AChR-positive and seronegative myasthenia gravis. Neurology. 2007 Feb 20. 68(8):609-11. [Medline]. McConville J, Farrugia ME, Beeson D, Kishore U, Metcalfe R, Newsom-Davis J. Detection and characterization of MuSK antibodies in seronegative myasthenia gravis. Ann Neurol. 2004 Apr. 55(4):580-4. [Medline]. Vincent A, McConville J, Farrugia ME, Newsom-Davis J. Seronegative myasthenia gravis. Semin Neurol. 2004 Mar. 24(1):125-33. [Medline]. Sanders DB, El-Salem K, Massey JM, McConville J, Vincent A. Clinical aspects of MuSK antibody positive seronegative MG. Neurology. 2003 Jun 24. 60(12):1978-80. [Medline]. Farrugia M, Melms A, Vincent A. Myasthenia gravis with MuSK antibodies. Pract Neurol. 2005. 5:356-359. Stickler DE, Massey JM, Sanders DB. MuSK-antibody positive myasthenia gravis: clinical and electrodiagnostic patterns. Clin Neurophysiol. 2005 Sep. 116(9):2065-8. [Medline]. Lavrnic D, Losen M, Vujic A, et al. The features of myasthenia gravis with autoantibodies to MuSK. J Neurol Neurosurg Psychiatry. 2005 Aug. 76(8):1099-102. [Medline]. Farrugia ME, Robson MD, Clover L, Anslow P, Newsom-Davis J, Kennett R, et al. MRI and clinical studies of facial and bulbar muscle involvement in MuSK antibody-associated myasthenia gravis. Brain. 2006 Jun. 129(Pt 6):1481-92. [Medline]. van Dijk JG, Lammers GJ, Wintzen AR, Molenaar PC. Repetitive CMAPs: mechanisms of neural and synaptic genesis. Muscle Nerve. 1996 Sep. 19(9):1127-33. [Medline]. Desmedt JE, Borenstein S. Diagnosis of myasthenia gravis by nerve stimulation. Ann N Y Acad Sci. 1976. 274:174-88. [Medline]. Simpson JA. Myasthenia gravis and myasthenic syndromes. JN Walton. Disorders of Voluntary Muscle. 3rd ed. Churchill Livingstone; 1974. 653-692. Stalberg E, Ekstedt J. Single fibre EMG (clinical experience). Electroencephalogr Clin Neurophysiol. 1971 Mar. 30(3):259. [Medline]. Stalberg E, Trontelj JV. Single Fiber Electromyography. Studies in Healthy and Diseased Muscle. New York: Raven Press; 1994. Ekstedt J, Haggqvist P, Stalberg E. The construction of needle multi-electrodes for single fiber electromyography. Electroencephalogr Clin Neurophysiol. 1969 Nov. 27(5):540-3. [Medline]. Ekstedt J, Stalberg E. A method of recording extra cellular action potentials of single muscle fibres and measuring their propagation velocity in voluntary activated human muscles. Bull Am Assoc EMG Electrodiagn. 1963. 10:16. Ekstedt J, Stalberg E. Single fibre EMG (method and normal results). Electroencephalogr Clin Neurophysiol. 30(3):258-9. [Medline]. Gilchrist JM, Massey JM, Sanders DB. Single fiber EMG and repetitive stimulation of the same muscle in myasthenia gravis. Muscle Nerve. 1994 Feb. 17(2):171-5. [Medline]. O'Neill JH, Murray NM, Newsom-Davis J. The Lambert-Eaton myasthenic syndrome. A review of 50 cases. Brain. 1988 Jun. 111 ( Pt 3):577-96. [Medline]. Lambert EH, Eaton LM, Rooke ED. Defect of neuromuscular transmission associated with malignant neoplasm. Am J Physiol. 1956. 187:612-613. Ward CD, Murray NM. Effect of temperature on neuromuscular transmission in the Eaton-Lambert syndrome. J Neurol Neurosurg Psychiatry. 1979 Mar. 42(3):247-9. [Medline]. Tim RW, Massey JM, Sanders DB. Lambert-Eaton myasthenic syndrome: electrodiagnostic findings and response to treatment. Neurology. 2000 Jun 13. 54(11):2176-8. [Medline]. Lorenzoni PJ, Scola RH, Kay CS, Werneck LC. Congenital myasthenic syndrome: a brief review. Pediatr Neurol. 2012 Mar. 46(3):141-8. [Medline]. McKusick VA. Online Mendelian Inheritance in Man. National Center for Biotechnology Information. [Full Text]. Engel AG. Current status of the congenital myasthenic syndromes. Neuromuscul Disord. 2012 Feb. 22(2):99-111. [Medline]. Ohno K, Tsujino A, Brengman JM, et al. Choline acetyltransferase mutations cause myasthenic syndrome associated with episodic apnea in humans. Proc Natl Acad Sci U S A. 2001 Feb 13. 98(4):2017-22. [Medline]. Engel AG, Lambert EH, Mulder DM, Torres CF, Sahashi K, Bertorini TE, et al. A newly recognized congenital myasthenic syndrome attributed to a prolonged open time of the acetylcholine-induced ion channel. Ann Neurol. 1982 Jun. 11(6):553-69. [Medline]. Engel AG, Ohno K, Milone M, et al. New mutations in acetylcholine receptor subunit genes reveal heterogeneity in the slow-channel congenital myasthenic syndrome. Hum Mol Genet. 1996 Sep. 5(9):1217-27. [Medline]. Engel AG, Ohno K, Sine SM. The spectrum of congenital myasthenic syndromes. Mol Neurobiol. 2002 Oct-Dec. 26(2-3):347-67. [Medline]. Harper CM, Engel AG. Quinidine sulfate therapy for the slow-channel congenital myasthenic syndrome. Ann Neurol. 1998 Apr. 43(4):480-4. [Medline]. Harper CM, Fukodome T, Engel AG. Treatment of slow-channel congenital myasthenic syndrome with fluoxetine. Neurology. 2003 May 27. 60(10):1710-3. [Medline]. Chaouch A, Müller JS, Guergueltcheva V, et al. A retrospective clinical study of the treatment of slow-channel congenital myasthenic syndrome. J Neurol. 2012 Mar. 259(3):474-81. [Medline]. Abicht A, Stucka R, Karcagi V, et al. A common mutation (epsilon1267delG) in congenital myasthenic patients of Gypsy ethnic origin. Neurology. 1999 Oct 22. 53(7):1564-9. [Medline]. Burke G, Cossins J, Maxwell S, et al. Rapsyn mutations in hereditary myasthenia: distinct early- and late-onset phenotypes. Neurology. 2003 Sep 23. 61(6):826-8. [Medline]. Dunne V, Maselli RA. Common founder effect of rapsyn N88K studied using intragenic markers. J Hum Genet. 2004. 49(7):366-9. [Medline]. Mayer RF. The neuromuscular defect in human botulism. Simeon Locke. Modern Neurology. Boston: Little, Brown and Co.; 1969. pp169-186. Taillac PP, Kim J. CBRNE - Botulism. Medscape Reference. Updated June 6, 2006. Available at http://emedicine.medscape.com/article/829125-overview. Edell TA, Sullivan CP Jr, Osborn KM, Gambin JP, Brenman RD. Wound botulism associated with a positive tensilon test. West J Med. 1983 Aug. 139(2):218-9. [Medline]. Denys EH, Norris FH Jr. Amyotrophic lateral sclerosis. Impairment of neuromuscular transmission. Arch Neurol. 1979 Apr. 36(4):202-5. [Medline]. Barr JR, Moura H, Boyer AE, et al. Botulinum neurotoxin detection and differentiation by mass spectrometry. Emerg Infect Dis. 2005 Oct. 11(10):1578-83. [Medline]. Gutierrez AR, Bodensteiner J, Gutmann L. Electrodiagnosis of infantile botulism. J Child Neurol. 1994 Oct. 9(4):362-5. [Medline]. Maselli RA, Bakshi N. AAEM case report 16. Botulism. American Association of Electrodiagnostic Medicine. Muscle Nerve. 2000 Jul. 23(7):1137-44. [Medline]. Cornblath DR, Sladky JT, Sumner AJ. Clinical electrophysiology of infantile botulism. Muscle Nerve. 1983 Jul-Aug. 6(6):448-52. [Medline]. Besser R, Gutmann L, Dillmann U, Weilemann LS, Hopf HC. End-plate dysfunction in acute organophosphate intoxication. Neurology. 1989 Apr. 39(4):561-7. [Medline]. Shailesh KK, Pais P, Vengamma B, Muthane U. Clinical and electrophysiological study of intermediate syndrome in patients with organophosphorous poisoning. J Assoc Physicians India. 1994 Jun. 42(6):451-3. [Medline]. De Bleecker JL, De Reuck JL, Willems JL. Neurological aspects of organophosphate poisoning. Clin Neurol Neurosurg. 1992. 94(2):93-103. [Medline]. Gordon RK, Haigh JR, Garcia GE. Whole Blood Robotic Cholinesterase Assay for Organophosphate Exposure - Testing Soldiers, First Responders, and Civilians in the Field and Laboratory. Storming Media: Pentagon Reports. 2004. [Full Text]. Booth B. Biosensor for rapid detection of organophosphate insecticides. American Chemical Society: Environmental Science and Technology News. 2005. [Full Text]. Prakash KM, Lo YL. The role of clinical neurophysiology in bioterrorism. Acta Neurol Scand. 2005 Jan. 111(1):1-6. [Medline]. Avasthi G, Singh G. Serial neuro-electrophysiological studies in acute organophosphate poisoning--correlation with clinical findings, serum cholinesterase levels and atropine dosages. J Assoc Physicians India. 2000 Aug. 48(8):794-9. [Medline]. De Bleecker J, Van den Abeele K, De Reuck J. Electromyography in relation to end-plate acetylcholinesterase in rats poisoned by different organophosphates. Neurotoxicology. 1994. 15(2):331-40. [Medline]. De Wilde V, Vogelaers D, Colardyn F, et al. Postsynaptic neuromuscular dysfunction in organophosphate induced intermediate syndrome. Klin Wochenschr. 1991 Feb 26. 69(4):177-83. [Medline]. Singh G, Mahajan R, Whig J. The importance of electrodiagnostic studies in acute organophosphate poisoning. J Neurol Sci. 1998 May 7. 157(2):191-200. [Medline]. Besser R, Hopf HC, Gutmann L, Dillmann U. [The decrement-increment phenomenon in disorders of neuromuscular transmission by inhibition of acetylcholinesterase]. EEG EMG Z Elektroenzephalogr Elektromyogr Verwandte Geb. 1989 Mar. 20(1):28-33. [Medline]. Repetitive nerve stimulation study. The baseline is unstable, causing the compound muscle action potential (CMAP) waveforms to move up and down, giving an irregular envelope to the train. Muscle movement is the most likely cause. This figure shows a decremental response to repetitive nerve stimulation in the deltoid muscle of a patient with a severe cervical radiculopathy. Repetitive nerve stimulation test in a hand muscle.